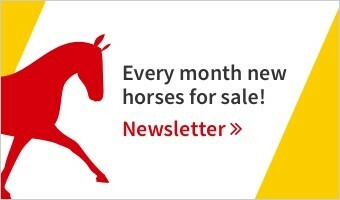 Discover selected show jumping horses for sale, trained at the renowned professional stables in Germany. From talented young jumpers to experienced Grand Prix competition jumpers. Scopey young horse for professional show jumping. Easy and uncomplicated to handle. Ready for 1.20 m.
Mare with potential for the highest levels of show jumping. Easy, well-behaved, affectionate towards humans. Ready for 1.30 m/1.35 m.
Powerful horse in good balance, easy to ride. Placed 1.35 m. Ready for the advanced class. Many placings up to 1.45 m class, also placed in M dressage. Good movements, very good rideability. Reliable even for high jumping levels. 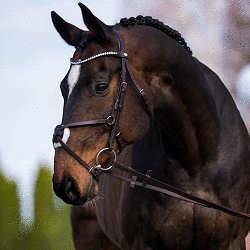 Ambitious, well-behaved sport horse for amateurs, young riders and juniors. Placed in 1.30 m, potential for the advanced class. Very scopey show jumper, ready for 1.50 m, placed in 1.45 m. Refined, athletic, always keen on jumping. Young mare with great jumping qualities. 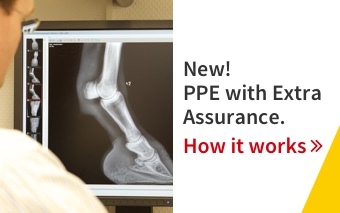 Perfect also for amateur riders. 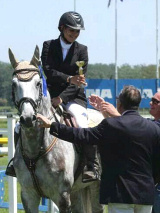 Mare for speed jumping, placed 1.30 m and 1.35 m. Also suitable for 1.40 m speed classes. Ideal also for junior riders.